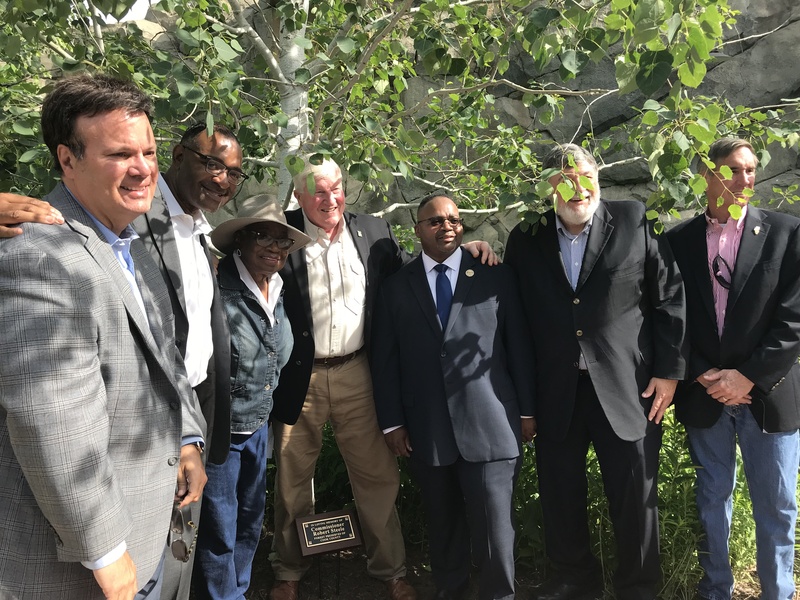 Cook County officials (from left) commissioners Peter Silvestri and Richard Boykin; former President Bobbie Steele; Zoo Director Stuart Strahl; and commissioners Dennis Deer, Larry Suffredin and Tim Schneider gathered for tree dedication at Brookfield Zoo in memory of Commissioner Bob Steele who died one year ago. The Deerfield-Bannockburn-Riverwoods (DBR) Chamber of Commerce Scholarship Foundation recently awarded its 2018 DBR/Takeda Pharmaceutical Company Science college scholarship to Deerfield High School Class of 2018 graduates Aaron De Lisle and Jacob Kraemer. The DBR Chamber of Commerce Scholarship Foundation is a non-profit, volunteer organization that provides financial assistance to help students in the 60015 zip code area pursue higher education. Since organizing the Dollars for Scholars scholarship program in 2002, the DBR Chamber has awarded more than $100,000 in college scholarships. Donations to the program can be sent to: DBR Chamber of Commerce, 405 Lake Cook Road, Suite A201, Deerfield, Ill. 60015. For more information, call 847-945-4660, send an email to info@chamber.com or visit www.dbrchamber.com. The Indian Trails Public Library District, 355 Schoenbeck Road, will host a special genealogy program, Discovering Your UK/Irish Roots Online: Websites for English, Welsh, Irish and Scottish Ancestry, from 7-8:30 p.m. July 12. Genealogist Debra Dudek will lead participants through the resources and search techniques for the three largest UK and Irish databases: FindMyPast, ScotlandsPeople and RootsIreland. Dudek will discuss what’s new on the databases, how to apply them to research efforts, and how privacy and information rights impact quests for official records. The program is intended for adults and will be held in the library’s Lake Room. Registration is required. To sign up, and for more information, call 847-459-4100 or visit www.indiantrailslibrary.org. Buffalo Grove High School announced that English teacher Ami E. Relf was selected among hundreds of applicants to participate this summer in a National Endowment for the Humanities (NEH) study of Alabama’s legacy in the Civil Rights Movement. Relf is one of only 30 NEH Summer Scholars chosen to attend NEH’s summer institute, titled, “Stony Road We Trod, Exploring Alabama’s Civil Rights Legacy.” Educators selected to take part in this intensive institute will participate in lectures by scholars, interact with iconic leaders and foot soldiers of the Civil Rights Movement, travel to key sites of memory as well as sites dedicated to the preservation of civil rights history (including Birmingham, Selma, Montgomery and Tuskegee), and review archival footage and other primary source documents. For more information, call 847-718-4000 or visit www.bghs.d214.org. 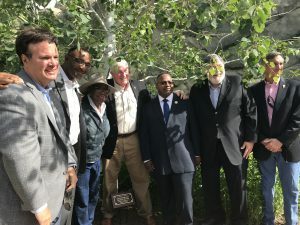 The village announced that its annual Downtown Tinley Park Block Party will be held from noon to 7 p.m. July 15 along Oak Park Avenue from 171st to Hickory streets. This year’s theme, “ ‘80s Life Amplified,” will be reflected in the event’s array of musical acts and family-friendly activities, including rides and inflatables, a classic car show, a bean bag tournament and more. KidZone activities include ‘80s-inspired dancing, TMNT’s Totally Rad Training Camp, a giant slide, mini golf, crafts and more. Musical acts include Maggie Speaks (noon) and Brass From The Past (4 p.m.) on the North Stage; and The Breakfast Club (noon), a Michael Jackson impersonator (3 p.m.) and Hair Band Night (4 p.m.) on the South Stage. In addition, the Teen Battle of the Bands competition (2 p.m.) will be held in the Subway parking lot, followed by Feelgood Unplugged (5 p.m.). Admission is free; food and beverages will be available for purchase. A free trolley will be available (beginning at 11:30 a.m.) from the 80th Avenue train station. Attendees are encouraged to dress in 1980s attire. For more information, call 708-444-5678 or visit www.tinleypark.org. The village reported that it has received Congestion Mitigation Air Quality (MAQ) grant funding to replace outdated bicycle racks, and (due to popular demand) add 20 enclosed bicycle lockers at the Schaumburg Metra Station, 200 S. Springinsguth Road. A total of 23 new bike racks, accommodating up to 46 bicycles, are located under a canopy to offer protection from inclement weather. In addition, 40 fully enclosed bike lockers are available to individuals desiring a completely protected and guaranteed daily parking space. Lockers are free, and leased on a 12-month basis, but require a $60 key deposit that is refunded upon cancellation of the lease if keys are returned. For more information, call 847-895-4500 or visit www.villageofschaumburg.com. The village announced that the Oak Park Community Relations Department will host a series of free youth job skills workshops from 2-5:30 p.m. (each day) July 30 through Aug. 3 at the Oak Park Public Library, 834 Lake St. Participating residents (ages 16-18) will learn skills such as resume writing, interviewing, career path development and interpersonal relations. Guest speakers and representatives from local businesses will be on hand to help participants develop critical job seeking and retention skills that can be carried into adulthood. Local employers will also offer opportunities for individuals who complete the workshops to interview for available positions. The number of participants is limited, and registration is due by July 25. To sign up, and for more information, call 708-358-5407 or visit www.oak-park.us/community.